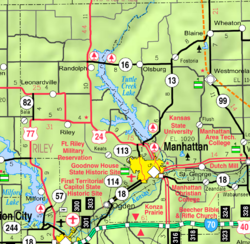 Manhattan is a city in the state of Kansas in the United States. It is at the junction of the Kansas River and Big Blue River. It is the county seat of Riley County. The city extends into Pottawatomie County. It is sometimes confused with Manhattan, New York. ↑ Hook, J. N. (10 June 2014). All Those Wonderful Names. Open Road Media. p. 255. ISBN 978-1-4976-1186-3. ↑ "US Gazetteer files 2010". United States Census Bureau. Archived from the original on January 24, 2012. Retrieved 2012-07-06. ↑ "American FactFinder". United States Census Bureau. Retrieved 2012-07-06. This page was last changed on 12 January 2018, at 06:59.